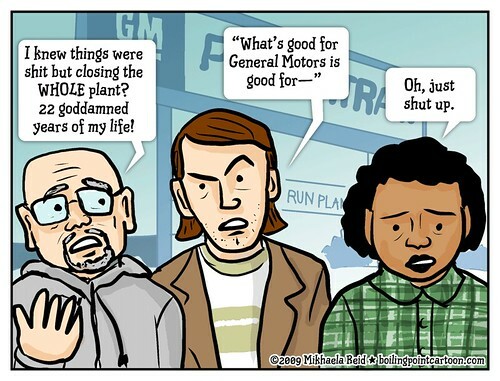 I drew this cartoon about the GM plant closings (about plant closings in general, but specifically with the Willow Run plant in Ypsilanti, Michigan in mind. Oddly enough, before I even got a chance to post it today, I received a nice email from the webmaster of UAW Local 735, saying that he had been given a copy of an earlier cartoon of mine on the effects of plant closings ("Jane Reaction") and asking for permission to run the cartoon on their site (which I of course granted). I'm not from Michigan myself, but I am from Lowell, a historic manufacturing city in Massachusetts that has had its share of ups, downs and plant closings aplenty (the American Industrial Revolution, anyone?). More recently, we used to be known as Spaghettiville, even, till Prince left town in 1997 taking hundreds of jobs with it. As a Detroiter and native of Michigan, thanks for remembering the impact on hardworking people on the ground. My emotions about GM couldn't be more mixed and uneasy, but my heart's behind those who are the latest of generations of people who gave their lives to the place.